Born in South Africa in 1933, Albie Sachs was raised in an environment of political activism. From an early age Sachs' father and mother encouraged him to fight against Apartheid, and he joined the ANC when he began studying law. While executing his first lawyering job as an Advocate at the Cape Town Bar, Sachs came to see laws as tools "to oppress people, not to protect people." At 28, Sachs himself was imprisoned and tortured, crystallizing his revolutionary vision of "soft vengeance," characterized by "conciliatory rather than defiant" behavior. 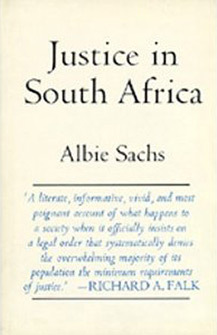 Sachs detailed his experiences in his acclaimed books, The Jail Diaries of Albie Sachs (1965), which drew world focus on the injustices of the Apartheid regime in South Africa, and Justice in South Africa (1974), for which he won the Anisfield-Wolf Award. Sachs was in exile from 1966 to 1977, at which time he earned a Ph.D. at the University of Sussex and lectured at universities worldwide. While Sachs taught in Mozambique in 1988, he was devastated physically and emotionally by a car bomb set by the South African secret service. Even still, Sachs wrote The Soft Vengeance of a Freedom Fighter (1990) a year later. Thereafter, he resumed his teaching career at Columbia University and founded the South African Constitution Studies Centre at the University of London. After the demise of Apartheid, Sachs transferred the Centre to the University of Western Cape in South Africa, where he was made Professor Extraordinary. Sachs was pivotal in the construction of South Africa's new Constitution. He presently serves as a Justice on South Africa's Supreme Court, where he still uses his conciliatory skills to empower South Africans during their country's political, economic, and social metamorphosis. He hopes to make films when he retires from the bench.